For the past five years, our family has spent our summers on the Eastern Shore, in Oxford, Maryland. 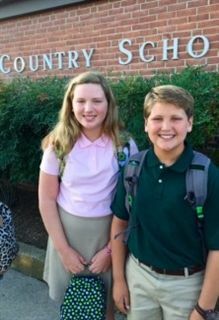 Each summer, Colin and Lilli (7th grade) have participated in the Oxford Kids Camp, sailing at the Tred Avon Yacht Club, and other activities in and around Easton. Through their activities, our family has been very fortunate to meet some incredible people. The children who became friends with our kids were always polite, sweet, intelligent, and fun-loving. It didn’t surprise us that we liked their parents, too! After awhile, we started to ask where these really nice, bright kids went to school. It was always the same answer – The Country School! So, when the time came to re-evaluate where we wanted to raise our children, we knew for certain that we wanted to be on the Eastern Shore…full-time. We were hopeful that Colin and Lilli would be able to enroll in The Country School. Our prayers were answered when they were both accepted last spring. After two weeks, Colin and Lilli are loving The Country School. The twins are in seventh grade. This fall, Lilli is playing field hockey and Colin is playing soccer. Lilli also enjoys basketball, dance, and theatre. She is a huge animal lover! Colin plays basketball and his all-time favorite sport is lacrosse. During the summer, Colin races a Laser sailboat with many of his Country School friends. In the winter, Colin enjoys snowboarding and ice skating. Lilli loves to ski. The academic curriculum at the Country School is challenging, but Colin and Lilli are really enjoying their teachers and their subjects. Math and Latin are two of Colin’s favorite classes, and Lilli is enjoying Art class and having Mr. Nittle for her English Teacher. They are also very excited about the hands-on learning experience that Echo Hill will offer. As parents, we couldn’t be more pleased. The Country School community has been warm and helpful with our full-time transition to the Eastern Shore. Most importantly, we believe Colin and Lilli are receiving the absolute best education to prepare them for their academic years to come. Thank you, Country School, for providing our children with an opportunity of a lifetime.